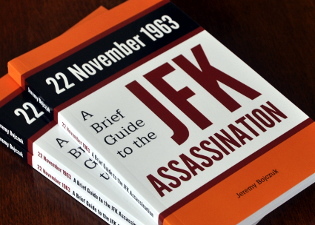 You are here: Home › Further Reading › JFK Assassination FAQs › Why Was President Kennedy Assassinated? The reasons would vary according to the alleged culprits: for Lee Oswald, fame; for Fidel Castro, to stop the US assassination attempts on him; and for anti-Castro Cubans, to punish Kennedy for the Bay of Pigs disaster. The short answer is: no–one really knows why JFK was assassinated. The reason why no–one really knows why he was killed is that there is no agreement about who was behind the murder, who pulled the trigger or triggers, or even how many triggers were pulled. And the reason why there is no agreement about many of the basic facts of the JFK assassination is that the case was never seriously investigated. Plenty of individuals and groups have been nominated as the killer or killers. Each potential culprit comes with a separate reason for having committed the murder. If you have ever read a newspaper report about the assassination, or seen a TV documentary, you will have been told that Lee Harvey Oswald, a 24–year–old ex–Marine, killed President Kennedy, and that Oswald almost certainly acted alone. That is the official verdict on the JFK assassination, handed down by the Warren Commission in 1964, slightly modified by the House Select Committee on Assassinations in the late 1970s, and dutifully repeated by the print and broadcast media ever since, with only occasional exceptions. Opinion polls, however, have consistently shown that a large majority of the general public has refused to believe what they have been told to believe, especially since the early 1990s, when Oliver Stone’s film, JFK , greatly increased popular awareness of the case. Among those who are familiar with the detailed evidence, probably only a very small minority have ever taken seriously the notion that President Kennedy was killed by a lone gunman. If Kennedy was in fact killed by a lone gunman, that gunman must have been Lee Oswald; there are no other plausible candidates. The Warren Commission was unable to find any reason why Oswald killed Kennedy. According to the Warren Report , “The Commission could not make any definitive determination of Oswald’s motives” ( Warren Report , p.22), and limited itself to speculating about Oswald’s mental state. One member of the Warren Commission, Senator Richard Russell, summarised those speculations for President Johnson: “he [Oswald] was a general misanthropic fellow … he had a desire to get his name in history and all” (see Richard Russell and the Warren Report ). This speculation is unlikely to be correct. The fact that Oswald consistently denied killing JFK suggests that even if he had committed the crime, the accused assassin was not motivated by a desire for fame and notoriety. The single–bullet theory, which requires that the non–fatal injuries to Kennedy and Governor Connally were caused by the same bullet, has been comprehensively debunked, on two main grounds. Firstly, the Zapruder film shows Kennedy and Connally reacting to their injuries separately. Secondly, the entrance wound in JFK’s back was too low to have allowed a shot from the sixth floor of the Texas School Book Depository, 60 feet or 18 metres above the road, to have come out of his throat and then hit Connally. If the single–bullet theory is false, the assassination cannot plausibly have been carried out by only one person. The wound in Kennedy’s back, and the wound in Connally’s back, show that at least two shots were fired from behind, a fact corroborated by many of the witnesses in Dealey Plaza. Geneva Hine, for example, watched the motorcade from her office in the Texas School Book Depository, which was behind the motorcade. She stated that shots “came from inside the building … the building vibrated from the result of the explosion” ( Warren Commission Hearings and Exhibits , vol.6, p.395). The home movies taken by Abraham Zapruder, Orville Nix and Marie Muchmore show that President Kennedy’s head moved sharply backwards after the fatal shot, which strongly suggests that at least that shot came from the front. Around forty witnesses claimed that one or more shots came from the general direction of the grassy knoll, which was in front of Kennedy. Paul Landis, for example, a Secret Service agent in the car behind Kennedy and Connally, claimed that “the [fatal] shot came from somewhere towards the front” (Commission Exhibit 1024 [ WCHE , vol.18, p.759]). Oswald had defected to the Soviet Union in 1959, and stayed there for about two and a half years before returning to the US. In Mexico City less than two months before the assassination, someone using Oswald’s name had met Valeriy Kostikov, a Soviet diplomat presumed by the CIA to be associated with the KGB’s assassinations and sabotage department. Perhaps Oswald, the communist sympathiser and possible Soviet agent, had played a part in a communist conspiracy to assassinate President Kennedy. While in Mexico City, the man calling himself Lee Oswald had attempted to obtain a visa to visit Cuba. In New Orleans a few weeks earlier, Oswald had acquired a reputation as an active supporter of Fidel Castro. Perhaps Oswald had participated in a communist conspiracy directed by Castro’s regime instead of, or together with, the Soviet regime. Oswald’s pro–Castro activities in New Orleans appear not to have been genuine. His political associates in the city were exclusively and strongly anti–Castro, and the branch of the pro–Castro organisation he claimed to have founded consisted only of himself. The organisation in question, the Fair Play for Cuba Committee, was being subverted by the FBI at the time, using infiltrators. If Oswald had been working for those opposed to Castro, perhaps it is they who were behind the assassination. These three sets of possible associates require three sets of political motives. It is difficult to imagine any plausible reasons why the Soviet regime might have wanted to assassinate President Kennedy. The Soviets had nothing to gain by replacing Kennedy with the less predictable Lyndon Johnson. Any credible evidence that the Soviets were behind the assassination would have risked precipitating a nuclear war, which had only narrowly been averted during the Cuban missile crisis just one year earlier. Yuri Nosenko, a KGB officer who defected to the USA in 1964, claimed that Oswald had not been recruited by the KGB, either before or after his defection. Although Nosenko was not believed by senior officials within the US intelligence system, his claims were corroborated by the KGB’s files on Oswald, which were made public in 1999. The files are available, in Russian with the US Department of State’s English translation, at http://www.paperlessarchives.com/FreeTitles/OswaldKGB.pdf (PDF; 9.2 MB). Castro’s motive would have been straightforward: personal survival. If he had expected the assassination attempts against him to continue indefinitely, the risk of provoking a military invasion or nuclear attack might have been worth taking. The only evidence linking the Cuban regime with the assassination is the dubious pro–Castro sympathies of the only person officially associated with the crime. Like the Soviets, Fidel Castro would not have expected his treatment to improve under Johnson. There was no reason for Castro to presume that the CIA’s attacks would continue indefinitely. He was aware that President Kennedy was attempting from late September 1963 to mend relations between the US and Cuban regimes (for an account of the covert meetings between representatives of Kennedy and Castro in the two months immediately before the assassination, see James Douglass, JFK and the Unspeakable: Why He Died and Why It Matters , Orbis Books, 2008, pp.69–74, 248–50). The Kennedy administration’s ambivalent attitude to the Castro regime suggests not only that Castro would not have had a good reason to kill Kennedy, but also that those opposed to Castro might have seen Kennedy as an obstacle to the overthrow of Castro. The large number of Cuban exiles living in the US. Those parts of the mafia that had owned profitable casinos in Cuba under the Batista regime but which had been evicted by Castro. Certain factions within the US security system, such as the CIA officers who were co–ordinating the terrorist attacks against the Cuban mainland and against Cuban ships. All three groups contained many individuals who openly berated Kennedy for not doing enough to overthrow Castro, and who blamed the president personally for the failure of the invasion of Cuba in 1961 at the Bay of Pigs, in which many anti–Castro Cubans were killed. These sympathies were shared by many senior members of the US armed forces, who also wished Kennedy to be more aggressive toward the Soviet regime and the peasant uprisings in south–east Asia. and had the means to bring about his assassination, including the framing of a patsy. It is clear that the JFK assassination was almost certainly the result of a conspiracy of some kind. An alliance of interests based around anti–Castro forces in the US possessed the means, the opportunity, and the most plausible motive.